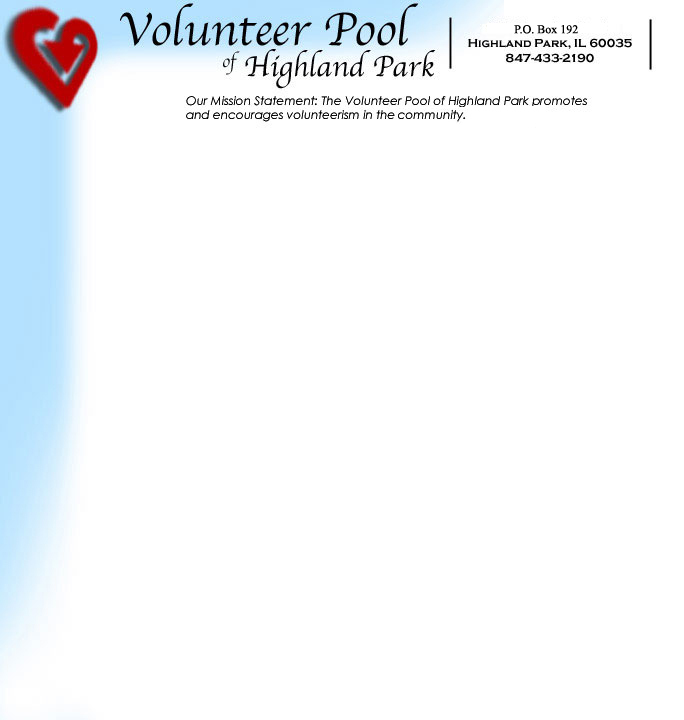 The Volunteer Pool of Highland Park has divided service options into nine categories of need: Art, Education, Community, Health, Homeless, Nature, Seniors, Special Needs, and Youth. Some agencies are listed under more than one category. Most of the opportunities listed on this web site are in Highland Park and the surrounding communities. You will find some listings for programs and organizations that are further away. This happens when the particular program or service in not offered by an agency in the local area. Education: Here you will find opportunities for tutoring, helping with homework, or helping with other educational events. Community: If you are interested in getting involved in local government or commerce, you may find a good match here. Health: This category covers both mental and physical health issues. There are many support opportunities that can be very fulfilling. Other possibilities include helping in hospitals, distributing literature, and fundraising. Homeless and Hardship: This group includes not only the “homeless,” but also people who are displaced from their homes through economic hardship or risk of personal abuse. In this category you will also find opportunities to help people who have shelter, but lack basic essentials for daily life, such as food and adequate clothing. Nature: This category covers both animals and the environment. There are many opportunities for education in this category as well as some hands on service projects that can really impact the community. Seniors: Here you will find traditional nursing home volunteer opportunities as well as requests for visiting those who are homebound, delivering meals, working at the Senior Center, and more. Special Needs: Individuals and groups of all ages and ranges of physical and cognitive disabilities are served under this category. There are opportunities to serve in structured programs that are as varied and as interesting as the individuals they serve. Youth: All issues dealing with youth, family, and general wellness are addressed under this category. You will find opportunities to tutor, mentor, and serve in a number of inspiring ways. Call the Volunteer Pool and we will put you in contact with the organization that fits your schedule and interests. Visit the agency location and receive an orientation or an overview of what you’ll be doing. Find out who will be your supervisor and clarify expectations about your volunteering. Ask questions and tell your supervisor about any concerns you have as well as any positive comments. Notice what you are learning and talk about it with everyone, except for confidential information. Take responsibility for your safety and well-being. Do not agree to requests you consider risky or inappropriate. Ask for help when you need it. Take your commitment seriously, because your volunteer time is valuable. Call the site ahead of time if you must be late or absent. Invite your friends to volunteer. Multiply the difference you make. Do not be discouraged if you need to explore several volunteer opportunities at different agencies before you find the right one for you. For 30 years Family Network has provided a warm caring place for families to connect and offer high quality child care. They have a morning Drop-in Center with a toddler room, preschool room and a” Baby and me” Room. There are special education programs for the parents and special events like family pizza night. On Thursday morning they have a special Dual Language morning. Volunteers are needed to help with publicity, summer classes and as an on-call receptionist. The Right from the Start program of Family Network is a special support, education and advocacy for Latino families with young children. They do prenatal, hospital and postnatal visits for new mothers and fathers. There are classes for parents and older children on nutrition, exercise, dance, jewelry making, storytelling and music. They also provide ESL and GED tutoring. Volunteers are needed for childcare while parents attend classes (volunteers do not need to be bilingual). After School Homework Helpers –programs at 2 local schools where volunteers are needed to assist children with homework. More helpers who love children are needed. Family Service seeks to be the leader in providing effective, responsive and innovative programs of human services. Family service assists individuals, families and communities in positively adapting to the ever-changing landscape of today's society. It is committed to the people it serves, to advancement of the field of practice and to proactive identification and response to changing societal needs. Escuela en Casa- immediate need for 1:1 tutors for ESL program. Volunteers do not need to speak Spanish. Meet in a convenient location and time. Nuestro Center in Highwood. Volunteers needed for homework program 4-5:30pm especially Mondays and Thursdays. On Fridays, come and share a special talent, art, chess, guitar. They have several guitars for a class/jamming session. Be a helper for Senior group at Nuestro Center on Mon. 12:30-3pm (summer 10am-12). Nuestro Center can also use Spanish speaking interpreters at certain events. Mission Statement: Our mission is to ensure that the infants and toddlers of working families have access to care and education in our community. Need volunteers to come into homes and do art projects, story times or anything educational that would give the children new stimulation. They also need donations of professional literature to use in their lending library and donations of toys and books to share with home child care locations. Tutoring volunteers are needed for tutoring on a one to one basis or in a class to help adults with basic education skills or ESL. Meetings take place in schools or library in Waukegan, Grayslake and Lake Shore. Two training sessions are mandatory and background check is needed. CRC offers meaningful volunteer opportunities in a professional setting. Volunteers needed to train to be part of the citizen emergency and disaster response in the community. Training required by the Police Department. The City of Highland Park is always in need of the talents and abilities of passionate citizens who are willing to devote their time to serve on City Boards and Commissions. Residents interested in applying for a City Board or Commission volunteer position should complete a New Commissioner Application and send it, along with a letter and their resume, to the Mayor of Highland Park. The Right from the Start program of Family Network is a special support, education and advocacy for Latino families with young children. They do prenatal, hospital and postnatal visits for new mothers and fathers. There are classes for parents and older children on nutrition, exercise, dance, jewelry making, storytelling and music. They also provide ESL and GED tutoring. Volunteers are needed for childcare while parents attend classes (volunteers do not need to be bilingual).After School Homework Helpers –programs at 2 local schools where volunteers are needed to assist children with homework. More helpers who love children are needed. Volunteers needed for work on special projects. In the Fall, house tour docents are needed for the Historical House Tour. The Highland Park Library is seeking volunteers to work with our friendly staff on a variety of tasks. Hours are flexible. If you are detail-oriented, well organized and enjoy customer service, this is the volunteer opportunity for you! Volunteers can share their talents in many opportunities such as helping in the computer lab, as a driver, friendly visitor, receptionist, helping with oral history "Life Stories Program,” and helping with other special projects. The "House of Welcome" is a specialized day program for people with memory loss and their families. Volunteers help with many group activities, baking projects, and socializing. A training program and a commitment for a longer period of time to volunteer is required. regardless of race, religion, family composition or any of the other legally protected classes. program. Will train free of charge. General support: Need help with a newsletter that is sent out twice a year, mailings and phone calls. Prairie State Legal Services, Inc.
Prairie State Legal Services is the civil legal aid program for Lake County. They provide free legal help to low-income, disabled, and elderly persons with problems such as evictions, foreclosures, domestic violence, disability claims, Medicaid denials, and consumer issues. They are looking for retired and practicing attorneys and paralegals who are able to volunteer on a regular basis. Those who devote two or three days per week work out best as they function as regular staff members and handle their own caseloads. They are also looking for a volunteer librarian to work a few hours a month. Other needs include volunteers to help with filling, handling mail, and fundraising. Volunteers who speak Spanish. Polish, or Russian are especially helpful. Mission Statement: To educate and inform students and adults about the hazzards of drinking and driving through educational programs. To assist victims during their court process with support and in some cases financial assistance. To improve the laws regarding DUI. Volunteers are needed to be trained to monitor the Skokie Court House misdeameanor court room. Each week the volunteer will be assigned to a court room where they will sit and gather information on completed DUI cases. This is a study being done for IDOT on the sentencing of DUI offenders. Training with be done at the court house. Men and women over 21 are needed. On going Monday, Tuesday and Wednesdays mornings. A national information center for Bone Marrow Transplant Survivors. They provide information and phone consultation to survivors and families. They also give national symposiums for survivors and loved-ones. Volunteers are needed for office help with mailings, data base entry, graphic design, photography and possibly counseling expertise. "Helping People Live better while living with Cancer". Many free classes, activities, information and outreach to cancer patients. Volunteers are crucial to the center's success. Volunteers are needed for administrative help, special events, outreach, help with workshops and activities. Suicide prevention and education, especially with at-risk teens. Voluteers are needed for office help with Quickbooks, marketing, computer skills, creating folders and board manuals. Southeast Lake County Faith in Action Volunteers (Selcfia) is looking for volunteers to help disabled, chronically ill and elderly residents remain independent in the community by helping them carry on with the normal, non clinical activities of living independently. These may include social support, grocery shopping, telephone reassurance, transportation, respite care. Selcfia is non-sectarian. A strong community program that focuses on health, fitness, and youth and family development. They have a free gym and fitness classes. Counseling services are available. Volunteers are needed for gym supervision and helpers for after school and literacy programs for young children. 1724 1st Street, Highland Park,Ill. Nicasa is a non-profit behavioral health and substance abuse prevention and treatment agency with several counseling centers in Lake County. Helpers needed in the summer to help with vegetable garden project at Judy H. Fried Center Women’s Service in North Chicago. Volunteer help needed for painting some of their facilities (as needed). North Shore University Healthsystem Hospice’s Award Winning Volunteer Program offers a number of volunteer opportunites for compassionate people. You may assist terminally-ill patients and their families with companionship, relief for caregivers, running errands, transportation, and office tasks. The Hospice program provides training for their volunteers and asks for a commitment of 3 – 4 hours each week. The Mental Health Association of the North Shore works to education youth and adults about mental health and social-emotional learning and help dispel the stigma around seeking help. They can use volunteers to help with mailings and other office work as well as staff booths and displays at community events. The Mental Health Association of the North Shore is also interested in speakers to topics relating to their organization. Volunteers prepare donated flowers, create beautiful bouquets, and make personal deliveries of hope and encouragement to neighbors in hospitals, hospices, and health care facilities. Volunteers also drive vans, serve as greeters, provide administration assistance and data entry, help with processing donated vases, and keeping facilities safe and clean. teens, families and communities who are coping with death and dying. settings with grieving families. A 20 hour training session begins Sept.
10. Please contact us for additional information. Volunteers help assemble meal packages of nutritious dehydrated food. Food is sent to many areas of the world to combat starvation. Short orientation required. Appropriate site for groups of volunteers. Time slots available for volunteers including weekend time slots. Services and housing for homeless women and children. or making and donating a meal. Volunteers need to fill out an online application. PADS means Providing Advocacy, Dignity and Shelter for the homeless. Volunteers may be needed at the PADS shelters to help prepare meals or to set up sleeping areas. Sites rotate each night from Oct. to April. They also need donations of socks, underwear and other supplies. Contact them if you want to make bag lunches for a shelter. Moraine Township offers a wide variety of general assistance including a food pantry and clothing closet. Volunteers are needed for specific Food Drives, but not on a weekly basis. In the summer, volunteers are needed for the "Pantry Plants and Garden Project". Digging, weeding, watering vegetable beds on a weekly basis. Short orientaton required. Help stacking and organizing food for food bank. Groups can volunteer including special needs groups. Various time slots available during the week and on the weekend. Fill out an application on-line. Call for a list of soup kitchens in the north suburban area. The Chicago Botanic Garden uses volunteers for different roles as greeters, tour guides, library work and other projects. In the summer, volunteers (teens and adults) are needed to supervise the Butterfly Garden. Also Teen volunteers are needed for Camp CBG from June to August. 1181 Riverwoods Rd., Lake Forest Il. Horsefeathers is a non-profit that provides therapeutic horseback riding for persons with special needs or disabilities. Volunteers from age 13 and up can apply to do chores and help groom horses, assist and walk horses. Also they would appreciate office work, painting /carpentry help. We are a registered 501(c)(3) non-profit, animal-assisted children’s literacy program, dedicated to readers, grades 1 through 8 on the North Shore. We take children on the “journey to literacy” from pre-school to college. We provide training for the handler of an existing therapy dog team on how to become a K-9 Reading Buddy team. Contact us if you love children, reading and dogs! K-9 Reading Buddy Teams: Certified therapy dog teams whose visits may include pre/middle/high schools, libraries, navy base and other community outreach events where we promote awareness or stress relief, as desired. Library Services Coordinators: Adults without a dog, who help manage our library reading nights and events, sometimes with the assistance of a Youth Volunteer. Youth Volunteers: Students without a dog, in middle or high school who help out at libraries and events. Visit www.k9readingbuddies.org for more details about our program. Email info@k9readingbuddies.org. Animal shelter and animal adoptions. Volunteers can attend and help with events, may help with fundraisers or sponsor an event. To have direct contact with animals, volunteers must be at least 18yrs old and sign a volunteer form/waiver. The Park District of Highland Park has several volunteer opportunites in connection to it’s Natural Areas. These are opportunites for individuals, families, and groups to work hands on in prairie and woodland areas. Projects are typically every Friday of the month from 9 – noon. Special workdays can be scheduled for interested groups. A Refuge for Saving the Wildlife, Inc.
Refuge for Saving the Wildlife is a not-for-profit parrot rescue, rehabilitation, education, adoption, and no-kill shelter facility. Activities include education of the public about parrots, rescue of abandoned/neglected/abused parrots, rehabilitation of parrots, and sanctuary for parrots. They also do raptor rehabilitation and related education. Volunteers are needed in the following areas: Architect, refuge help, newsletter, CPA, pet taxi, carpenter, plumber, builder, and general contractor. Items needed: Flat sheets, paper towels, 24”x30” lined freezer/butcher paper, HP paper and printer cartridges, Xerox dry ink, stamps, #10 envelopes. Highland Park and surrounding suburbs. Faith in Action is helping seniors stay in their residence. Volunteers help as friendly visitors, drive seniors to appointments, take seniors grocery shopping, do home repairs for seniors. Interview and application process is required. Volunteers needed to deliver meals in the Highland Park area. Drivers cover one route a week (Monday-Friday), beginning at 11 a.m., for 1-1/12 hours. Volunteers are helpful with activities for residents games and friendly visiting. Playing a musical instrument is enjoyed by residents. Volunteers help with activities such as art or music classes for seniors. Application process and screening is required. The Adult Community Transitions Program focuses it’s efforts on supporting young adults with developmental disabilities in their efforts to be independent and to contribute meaningfully to their community. ACT offers participants experiences that enhance social relationships, personal growth, self-sufficiency, employment, and volunteer opportunities. ACT is looking for volunteers to speak to participants about life skills and employment. They are also interested in volunteers that can offer tours, demonstrations, or teach tasks. Another need is for volunteer opportunites for ACT participants. Many are interested in making a difference in the community. Participants have a variety of skill levels and would be accompanied by staff when necessary. Perhaps you would like to provide an opportunity for a volunteer or even for employment. 427 Sheridan Rd. Highland Park, Ill.
Software testing which harnesses the power of people with Asperger’s Syndrome. Volunteers needed to help with fundraising and special events. Dedicated to help establish one-one friendships and employment for people with intellectual and developmental disabilities. “Best Buddies Citizens Program” pairs adults with disabilities with volunteers in the community for one-one friendships. A one-year commitment is needed to participate in this program. Buddy and “citizen buddy” talk and meet about once every 2 weeks. Interview and background check to volunteer. The Center for Enriched living is a program for people with developmental disabilities to be fully included in the community. They have an Adult Day program and afterschool and other social and leisure programs for children, teens and adults. They also have a Summer Camp that they need volunteers to help the campers. For specials events: Fall and winter dances, and outings during the year, volunteers are needed. 400 E. Illinois, Lake Forest Ill. Promotes the development of youth and adults with physical /visual disabilities through recreational and sports activities. Help with special events. May require training. Volunteers also needed with office work, marketing, grant writing and outreach. Lambs Farm offers a full range of residential, vocational, social, and recreational services to adults with mild to moderate developmental disabilities. Lambs Farm is looking for volunteers to provide administrative help, gardening, work in the thrift shop of the restaurant, or help with special events. NSSRA enriches the lives of people with disabilities through quality recreational services by partnering with Park Districts in many of the Northern suburbs including Highland Park, Deerfield, Northbrook, and Northfield. Volunteers assist special needs programs in Park Districts. Some of the programs where volunteers are needed are Sports Buddies, Creative Theater Companions and Ice Skating Buddies. Volunteer in Highland Park for PAF. PAF is a rare genetic disorder in infants and children that requires more research. Help is needed in many areas, including: General office work, designing brochures, and computer experience with Excel spreadsheets. Community living for rehabilitation and long-term treatment for Veterans. Volunteers would be appreciated to help with recreational activities, also one-to -one escorts on trips and special events. On Sundays, escorts are needed to help residents to church services and the 4th Sunday each month, help is needed for a brunch from 10am-12. Volunteers can help in media room and kitchen for cooking, restocking. Weekends, evenings, and some weekday evening times are available. The American Indian Center serves at the main community center for Native Americans in the Chicago area. The organization strives to address community needs educationally, culturally, and economically, and the overall well-being of community members. The AIC hosts many activities throughout the year including the annual Chicago Powwow in November. AIC offers volunteer opportunites year round in it’s after school program, maintenance, food pantry, and administrative offices. They also need volunteers to help with the annual Powwow and other special events. Studies show that many low income families do not have books to read to their children. Bernie's Book Bank has distributed more than 1 million books in 3 years to at-risk children in the Chicagoland area. Volunteers can donate books or help at the warehouse to sort, sticker and bag collections of books for at-risk children. Volunteers can be individuals or groups. Many time slots available weekdays and Saturday morning drop-in hours. Big Brothers Big Sisters is excited to announce that we are offering an Evening Site Based Mentoring Program in Highland Park! We are looking for individuals who would be paired up in one-to-one mentoring relationships with youth from the Highland Park & Highwood Communities. Mentors and mentees would meet every other Monday from 6:00-7:30pm at Oak Terrace Elementary School for structured mentoring, supported by a Big Brothers Big Sisters Program Coordinator, and attend field trips out in the community the last Sunday of every month. Special Skills: Mentors must be over 21 years of age, and be able to make a commitment of one calendar year. Usually CASA Volunteer time commitment is 10-15 hours per month or 1 or 2 cases a month. There is a 40 hour training program. 736 N. Western, suite 226. Lake Forest Ill.
A literacy tutoring program serving elementary schools in North Chicago. 1:1 tutoring reading. No experience necessary except a love for reading.